Where can i find OEM decals for my 2005 Superhawk; the (Superhawk 996) on the side fairings are needed. Been searching for a couple hours now and nothing. My body shop guy is repairing my front right fairing but said sticker needs to be replaced so looking for OEM sticker. I dont want replica sticker because i just noticed today that the "Superhawk" lettering has actual metallic glitter on the sticker lettering, great detail, not sure if replica would have that. Also, how much do they cost? Anyone order em before? 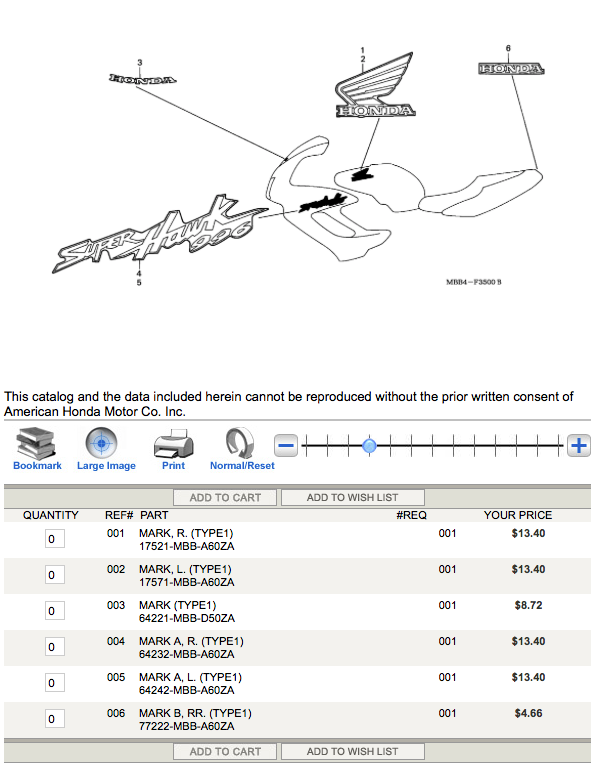 Check Partzilla for OEM parts for your year and find the page for "Marks". Looks like they may or may not be available depending on year and, maybe, color??? For 99 & 00 there are two different "SuperHawk 996". Don't know the difference. You should research that and let us know. Just curious, how much are you paying for repairs? New or almost new pieces are probably cheaper. I've ordered them before from RonAyers. Call and double check because I've run into where you can order stuff from them and Partzilla online only to get an email weeks later that it's no longer available. If you were to run into that I'm sure you could send a file to Tapeworks and they'll make you whatever you want. Bought indicator mirrors, what to do with my side fairings?